Pure Dancing with the Stars » Peta Murgatroyd And Ron Artest Talk On Rehearsals, The Cha Cha Cha, The Moving Stage, And More! 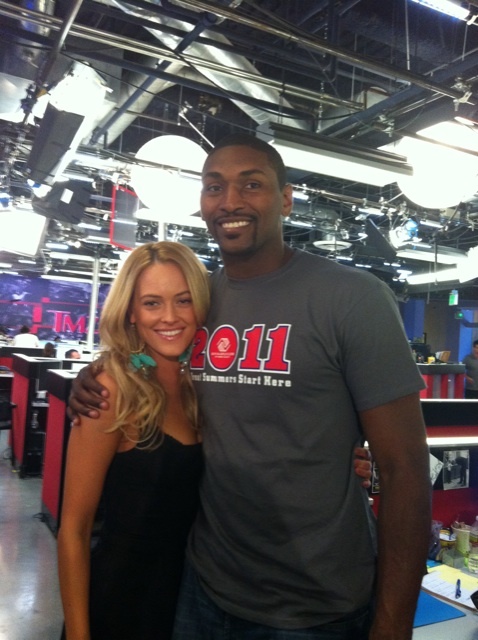 Peta Murgatroyd And Ron Artest Talk On Rehearsals, The Cha Cha Cha, The Moving Stage, And More! Today TMZ interviewed Peta and Ron. Peta says they’ve had about three rehearsals so far and Ron is doing “very well”. She is very happy with his progress so far. They talk of their height differences for where she’s 5’7″ and Ron is 6’7″. She plans to wear 3″ heels for their dances. Currently, the two are working on the Cha Cha Cha for week 1 and the Quickstep for week 2. They discuss the new moving stage which Ron didn’t know about. The look on his face is a ‘look of fear’ while Peta calms him down (LOL, I think I would be scared of a moving stage too? 😯 ). They also talk on the NBA lockout, but, Ron thinks it will all work out somehow where he can still dance if the lockout ends. It’s a super cute interview and one of Peta’s first interviews as a Pro teacher. I love how TMZ tagged them with the title “Beauty And The Peace”. So perfect. All this and more at the 29:02 minute mark >>>>HERE. Photo above from Peta’s twitter page. Adding: You can also listen to them talking to ESPN radio in a new audio interview HERE as well. 11 responses to "Peta Murgatroyd And Ron Artest Talk On Rehearsals, The Cha Cha Cha, The Moving Stage, And More!" Anyway you guys can get a shot of the new set so we can see it before the premiere? I like PETA, although, sometimes I think she thinks she is star. Here’s a radio interview with Chynna. I love the Hills and I love Mark …. That’s my couple. Another team looking like they’re having so much fun! I’m glad Peta is finally a pro, and I think she and Ron will be fun to watch. Yes, should be fun. My guess-won’t be the first to exit. I think we will see a quieter Ron Artest, as we saw with Chad Ocho…. Wonder how Nancy Grave will do??? Nice interviews of Chynna and Carson. Carson was very very funny. It would be nice if Vogue post them. I would have missed them if i hadn’t look here. Thanks! They are coming up soon!! We’ve had a lot to post today and we’re trying to get everything that we can up. Don’t worry Vogue, you guys do a great job.